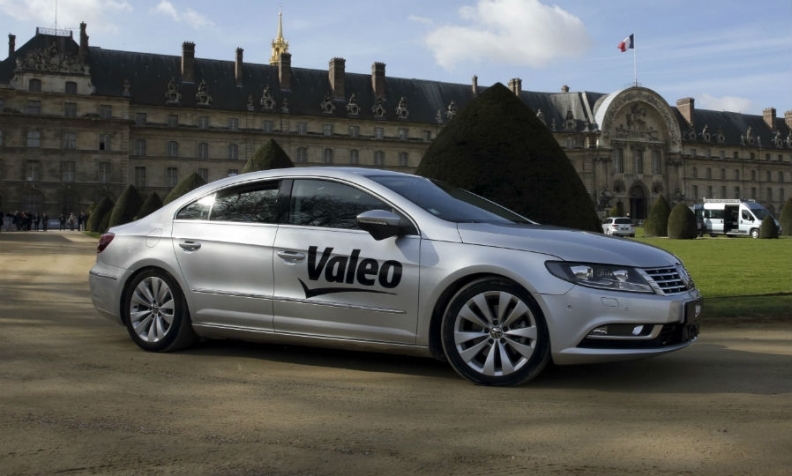 Valeo and Safran unveiled their jointly developed self-driving car, the Drive4U, in Paris. The car combines technology from the automotive and aerospace industries. PARIS (Reuters) -- Valeo plans to draw on drone software and other military technologies from partner Safran to offer self-driving vehicle platforms to carmakers by the end of the decade. Valeo said the first applications may reach automaker customers within three years. The French supplier demonstrated an autonomous car and other prototype systems jointly developed with Safran, the French defense and aerospace group on Friday. Under a 2013 research and development agreement, the Paris-based companies are collaborating on self-driving systems with final applications ranging from hatchbacks to unmanned aircraft. "We realized very quickly that we had much more in common than we'd expected," Valeo innovation chief Guillaume Devauchelle said. "It turns out that an autonomous vehicle is really a terrestrial drone." Cars that complete whole journeys without human input are still many years away, but creeping automation is well underway, with models already on sale that can pilot themselves through slow traffic and hit the brakes when a pedestrian steps out. Analysts see a booming market for the vehicles and the connected services their hands-off drivers will be increasingly free to consume. And with Google and Apple both entering the fray, the traditional auto industry is braced for disruption. The Valeo-Safran collaboration works because each company serves distinct markets, Valeo CEO Jacques Aschenbroich said. Valeo has the right to sell joint technology to automakers, leaving defense, aerospace and rail applications to Safran. Safran is now offering to equip armored vehicles with 360-degree camera software developed by Valeo as a parking aid, the companies said. Valeo-equipped self-driving cars will draw on infrared imaging, algorithms and "dynamic mapping" used in Patroller drones and other Safran hardware. The joint r&d push has yielded "an absolute outpouring of ideas," Aschenbroich said. "Within a fairly short space of time you'll be seeing a lot of Safran technology in cars [equipped by] Valeo, and plenty of Valeo in Safran aerospace and security products."